FlightSafety offers comprehensive, professional training on all models of the Dassault Falcon 900EX. Our highly qualified and experienced instructors, advanced technology flight simulators and integrated training systems help ensure proficiency and safety. We provide pilot training for the Falcon 900EX at our Learning Centers in Dallas, Texas, and Teterboro, New Jersey, and maintenance training at our Learning Centers in Dallas, Texas; Paris-Le Bourget, France; and Wilmington, Delaware. FlightSafety International provides iPads at no cost to pilots enrolled in Falcon 900EX training in lieu of printed manuals. This keeps pilots connected and engaged in an interactive learning experience throughout their training. Advance your career while enhancing safety and improving dispatch reliability with FlightSafety’s exclusive Master Technician training for the Falcon 900EX. Master Technicians are recognized throughout the industry as having achieved the pinnacle of training for their aircraft. Training courseware and training devices for the Falcon 900EX were developed in conjunction with Dassault Falcon in accordance with the Falcon Training Policy Manual. A eLearning CPDLC course is available for the Falcon 900EX. This FAA-approved course satisfies the training requirements of AC 120-70 (as amended) and meets the international standards set by the International Civil Aviation Organization (ICAO). 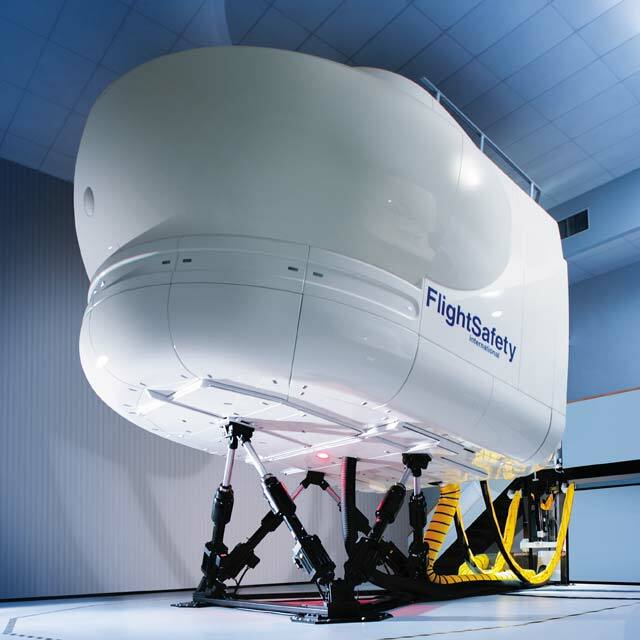 FlightSafety is the original factory-authorized training provider for Dassault Falcon and has been providing training on this platform since 1998. Our Falcon 900EX simulators have been upgraded to FMS 6.1, which allows customers to train WAAS/LPV approaches with the latest FMS software. Our highly experienced instructors include military pilots, chief pilots and Dassault Falcon demo pilots who possess broad knowledge of corporate aviation and are dedicated to your safety and proficiency. Cabin Safety training is available at our Learning Centers in Dallas, Texas; Paris-Le Bourget, France; and Teterboro, New Jersey. Honeywell Primus 2000 Line Maintenance training is available for the Falcon 900EX/900C at the Learning Center in Dallas, Texas. Falcon 900EX simulator at Dallas North has been upgraded with the Elite II avionics package.